The rough translation of the song is Sri Rama's Name is pleasant for the mind chanting of Sai Baba nama saves us. He gives us all boons. He destroys diseases, drives away evil and gives Poorna life. He is like the mother. He helps us when we are confused. The more our bhakti the more He blesses. The next bhajan , the lyrics above and the video gives the tune. 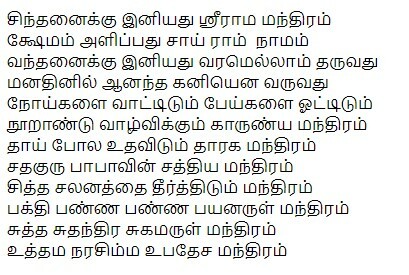 The translation is why should we worry when the Karunyamoorthy Sai is with us. The bad effects of our karma are driven away by Him. The mind is calm when we have Darshan of His Divine self. He takes care of those who surrender to Him. He blesses us with children and wealth. Let us believe and offer ourselves to His Feet. 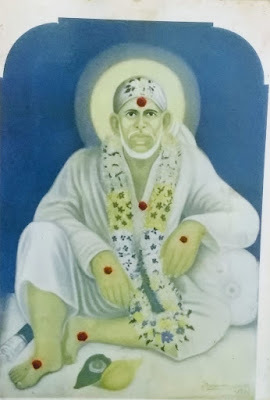 My father was a great devotee of Sai Baba. This photo is there in my parents house for more than 60 years. Every Thursday my father used to sing bhajans , my mother prepared the prasadam and we as young children used to sit near him and sing along with him. We do not know who composed these songs . After years of effort my elder brother made a booklet of the songs from his memory . I am sharing some of these songs here. The video(s) are added later. Watching the video will give us an idea of the tune. I am not a qualified singer but bhava and bakthi are there and I think that will suffice for us amateurs. My mother used to prepare milk with sugar , cardamom powder called "gnana paal " every day as naievedyam. It was a divine coincidence that every day a dog came after the bhajans to our house for the milk. Navarathri was very special . We had grand Puja on all nine days. There was bhajan on all nine days in the evening. On Navratri Ekadasi , His Aradhana Day was celebrated . In the morning abhishek was performed to the idol , Puja. My father brought lots of flowers from Salem and in the evening performed Sahasranama Archana offering was moong dhal kheer and urad dhal vada. Then the idol was taken outside in the streets of Omalur to bless all devotees with Nadaswaram . My younger brother and I were given the task of bursting crackers. When the idol returned in the evening at around 8 pm bhajans started and went up to 10 pm. After bhajans naivedyam was 10 kg sweet pongal and 10 kg brown channa sundal prepared by my mother. This was distributed to all devotees. We drew colourful rangolis before Baba every day. Aarti plate made from rava and honey was also part of the Pooja.